If you’re looking for a last minute Super Bowl cake, Perfectly Chocolate Bundt Cake has got you covered! This is the fastest, most convenient, and economical cake I know of. Plus you probably have all the ingredients in the pantry right now. Or at least for the cake. You may not have everything for The Cake Mix Doctor’s Marshmallow Frosting, but this cake can be drizzled with just about anything including a basic chocolate ganache. The “secret” source of this recipe is Hershey’s, but I got it years ago from my cousin, Julie. We usually make it as cupcakes or layers, but I’ve been on a Bundt cake kick and wanted to use a fluted pan. For the cocoa powder, I use natural, but Dutch process also works well. And if you prefer using buttermilk in place of milk or coffee in place of water, go for it. The only thing to watch carefully is the time. Mine was done in 45 minutes, but sometimes it takes up to 55 depending on your oven and pan. An easy Bundt cake made in one bowl. Preheat oven to 350 F. Spray a Bundt pan with flour-added baking spray. Mix together flour, sugar, cocoa, soda, baking powder and salt in large bowl. Add oil, milk, eggs and vanilla. Beat two minutes with electric mixer at medium speed. Stir in water until blended. Batter will be thin. Pour batter in the Bundt pan and bake for 45-50 minutes or until skewer or pick inserted comes out clean. Let the cake sit in the pan for about 10 minutes, then carefully turn it from the Bundt. To make the frosting, sift the sugar and set it next to the stove. Keep the cocoa powder handy, too. I don't usually mix the two ahead of time, because I know I'll use all of the cocoa powder, but I don't always use every bit of sugar. Combine the butter, marshmallows and milk in a large (3 quart) saucepan. Heat on medium to medium low, stirring often, until melted and smooth. Remove from heat and stir in cocoa. Add about half the powdered sugar and stir well, then gradually add more until you get just the consistency you want. I usually use it all. Add vanilla and stir until smooth. Pour over the cake, letting it fall down the sides and into the center. For shiny, heavy Bundt pans use 350 degrees F. For black Bundt pans, use 325F. if using buttermilk, increase soda to 2 teaspoons and decrease baking powder to 1. Actually, it means 1 1/2 teaspoons each. Good evening Anna I made this cake twice it cake out perfect I just can’t remember the measurements for the baking powder and baking soda. It reads 1 1/2 so do mean 1/2 teaspoon of each. The cake only has oil, so you don’t have to worry about that part, but for the icing I recommend any butter you have around. I used unsalted, but in this case I think salted might be just as good or even better. Bill, thanks for the comment! This is one of my favorites, too. This cake is wonderful! I don’t even need frosting! This is coming from a cake monster! Anna, the cakes all came out great, even with the overflow. The 3 cup bundt pans (or “bundform” as they’re described on the insert.) are made by Kaiser and I got them on amazon. They’re cast aluminum, nonstick, and I got two different designs. One cake is a perfect size for 2 – 4 people, so depending on which recipe you use, you’ll get two cakes OR two cakes with a dozen or so cupcakes! Linda, thanks for the info! I usually use a 10 inch, 12 cup Bundt pan for this recipe or I divide it in half and use a 6 cup Bundt pan. I love the 6 cup size because it accommodates a half batch of almost any standard size Bundt. The 3 cup size Bundt pans must be very cute! I guess next time you might want to just halve the recipe and then divide among the two 3 cup Bundts. Now I feel like I need to buy a couple of 3 cup Bundts. Those must be handy. Hi, I just made this -still baking-but wanted to share. I have two 3-cup bundt pans, and am using them for the first time. The recipes included with them has about the same volume as this, and says to divide between the two. I ended out filling both pans about 3/4 full, and then having enough batter for 9 regular sized cupcakes. As I’m watching them bake, that was too much batter for the pans. They didn’t overflow per se, but have risen above the top rim and are sort of mushrooming. Next time, I’ll pour batter into 12 cupcakes, and then divide the remainder between the two bunds pans. Oh no, just looked and one of the pans did overflow. I shouldn’t have pushed it. Maybe it was the whiskey I substituted for part of the water. :). I was in Wegmans earlier and they were handling out samples of their Irish cream ice cream. The young woman said she had made a chocolate cake, left it unfrosted and served the ice cream over it. I couldn’t resist either! I have made this recipe often and love bundt cake. However, for a change, I’m thinking of making it as a layer cake and making 7 minute icing. I think it’ll be awesome! Joy, I used a 12 cup Bundt. Just halve the recipe and you’ll be fine. You might have to adjust the baking temp and time somewhat for silicone, but I’m not sure. Glad you liked it! What we’ve noticed around here is that it gets better with age, so you may like it even better today and tomorrow than you did last night. But yes, I love that it uses oil. It’s cheaper, easier to use and keeps the cake moist. I made this last night and it turned out really well. I was worried about the lack of butter or melted chocolate making it not rich/chocolate-y enough, so I added some mini-chocolate chips (about 1/3 a cup) and I really should have left them out. It would have been plenty chocolate-y without them. I also used a bit of buttermilk as I had about a 1/3 a cup on hand and just mixed it with 2/3 a cup of skim milk. Oh, and I did add about a Tbs of espresso powder to the boiling water. This particular icing/frosting is really shiny, but it doesn’t set up quite like ganache. That is, it’s a little bit sticky. I have tried so many ganache and icing recipes that I forget which is which, but one that I have used over and over and that you might like is the on I use on my Boston Cream Pies and Boston Cream Poke cake recipe. It’s super easy and definitely a little firmer than the one in this photo. Here’s the link. http://www.cookiemadness.net/2012/03/boston-cream-poke-cake/ It uses 4 tablespoons butter, 2 ounces of unsweetened chocolate, 2 cups of sifted powdered sugar, some boiling water and a little vanilla. There is something special about a Bundt cake. This one looks wonderful! Anna, does this frosting/glaze set/dry to the point where you can touch it and nothing sticks to your finger? I am looking everywhere for a ganache-like frosting that really sets up. Yours is SO shiny and pretty. You’re right, I have everything in the pantry to make this cake. It looks moist and delicious. 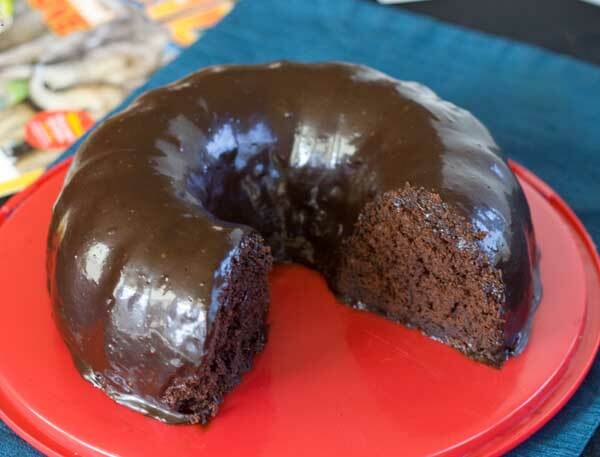 I always wonder, what makes a chocolate frosting shiny and I would like to achieve that when making chocolate frosting. I like poured icing/frosting. What do you think is the secret? I made Rice Krispie Bars for game day. Aren’t you impressed!? I did brown the butter, woo hoo!! Oh yummy! I wish my hubby liked chocolate cake. Sigh, what event is coming up that I can make this to take to and have a slice and not the whole thing left over at home??? This was the chocolate cake recipe my Mom made when I was a kid, but she most often baked it in a 9×13 pan, never a bundt. Can’t wait to give it a try. The icing looks and sounds perfect. In a word–amazing! I’m not a marshmallow person, but that frosting sounds quite intriguing as well. The frosting makes it look like a giant Hostess cupcake (with the peelable frosting). Anna, I been wanting to try out my new Bundt pan and this the perfect recipe for us. Since our team (Pittsburgh Steelers) are not in the Super Bowl and we are waiting for more snow to fall, I have been cooking/baking all weekend. Sheila, my cake was still a little warm when I put the frosting on. However, the frosting goes on while the frosting itself is warm, so it really doesn’t matter. If you want the frosting to be a little thicker, you can let it sit and cool in the pan. I poured mine on almost immediately after taking it off the stove because I wanted it to really drip down all over the cake. A lot of it went into that center hole, but I dug it out. YUM! Is the frosting put on while the cake is warm? Thanks! This looks amazing! Happy Super Bowl Sunday!